Each team is comprised of six players; three players are constrained to one half of the main dodgeball court, while the other three stand at the sidelines surrounding the opposing team. Before play begins, the player may chose the configuration of the six players on the court. 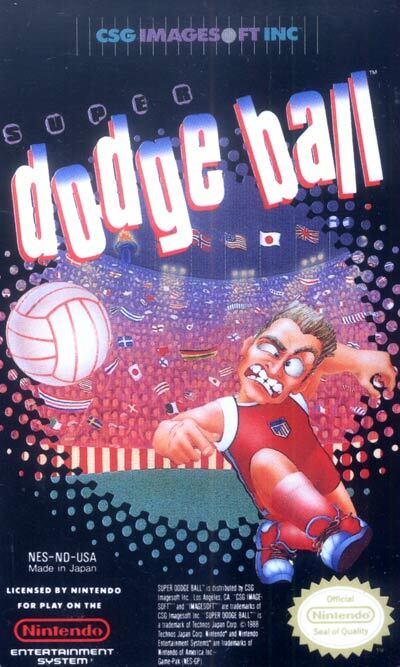 During play, the player (or players) may pass the dodgeball with A or perform an attacking throw with B. Players can jump by pressing both A and B, move using the directional pad (although sideline players are restricted to the area adjacent to their sideline) and run (in-bounds players only) by tapping left or right continuously. A ball can be caught by pressing B slightly before impact; pressing A without the ball will cause the player to duck. Being struck with an attack causes a player to lose health points; being struck with a pass stuns the player. A team is victorious when all three opposing in-bounds players have lost their health; sideline players are immune to such a loss, but can still be stunned when struck. In addition, throwing the ball after running for a certain distance will unleash a Power Shot that is significantly more powerful, hard to track, and hard to catch. Due to the lack of mobility of the sideline players, they generally cannot throw these attacks. You can also throw an aerial Power Shot by jumping during a run and throwing the ball at the peak of your jump; however, you do not need to run at any particular distance to throw one.